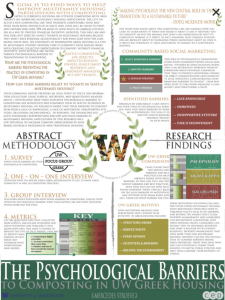 For my UW senior capstone, I collaborated with Seattle Public Utilities and the Community-Based Social Marketing approach to promote composting practices within the UW Greek Community. 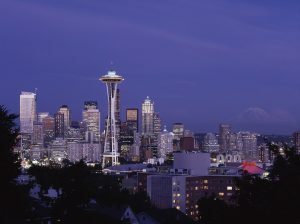 Seattle is currently focusing on citywide composting and has enacted a composting ordinance that prohibits compostable food and paper from being disposed of in waste bins. Fines are being issued to property owners who have 10% or more of food waste in garbage containers as a way to provide financial incentive. However, this law does not directly impact tenants in multifamily housing because they don’t have personal accountability for what goes into the communal waste bins. The University of Washington Greek housing is a type of multifamily student housing that currently faces similar issues with creating collective participation to compost. Without financial incentive, both settings are facing various psychological barriers to transitioning to composting. 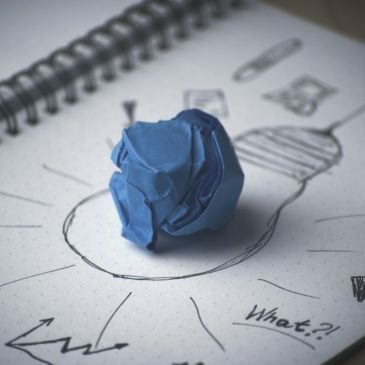 I worked with Green Greek Representative Program Director Tali Haller to connect with different Greek chapters to gather information on composting barriers through surveys, interviews, and quantitative measurements. After investigating different psychological barriers to composting, I suggested sustainable interventions for each house in my report titled “The Psychological Barriers to Compost in UW Greek Housing.” My research shows that barriers to composting stem from a lack of knowledge, an absence of motivation, unsupportive attitudes, or general inconvenience. I coordinated with multiple Greek Chapters, including Sigma Kappa, Sigma Alpha Epsilon, and Psi Upsilon. Each house I coordinated with had members that were incredibly passionate and dedicated to making their home more sustainable. Their compost bins were all easily accessible with prompts to help remind and educate house members. However, their Green Greek Representative experienced a lot of push back. 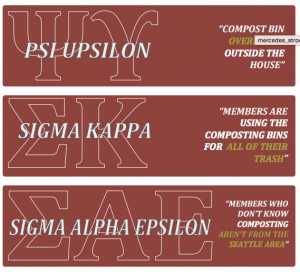 While 90% of the Greek members I interviewed generally knew what went into compost bins, only 37% were aware of the Seattle composting ordinance or the fines that were being issued to their house. 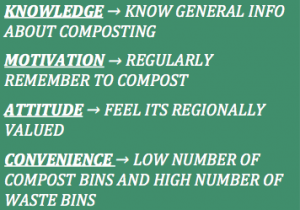 Among these 4 barrier types, 67% of members showed a high barrier in regards to motivation and attitude toward composting. Together, Tali and I have been working to overcome the “attitude” and “motivation” barriers by establishing social norms and creating a positive environment around composting. We’re also looking into ways to display the high-level of local community support for composting practices to encourage action! Check out the Final Presentation, the 55-page Full Report, or Mercedes Project Site. 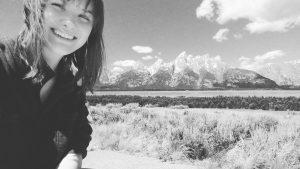 Mercedes Stroeve recently received her Bachelors of Arts in Community, Environment, and Planning (CEP) with a minor in Urban Design and Planning at the University of Washington. Her education focus was around mitigating climate change and creating collective action to improve circumstances. She has worked previously with UW Transportation Services where she promoted sustainable commute options and helped reduce UW commuter’s emissions. Currently she is working with the Mass Transit Now campaign to help pass the Sound Transit 3 initiative to help expand our existing system of light rail, commuter rail, and bus services in the Puget Sound Region.